Spring football is often a time for acclimating young players to the intricacies of a division I playbook. It’s also a good time to emphasize and tweak countless position-specific techniques. New defensive coordinator, Mike Elko, has chosen to allocate a chunk of spring ball to teaching some of the fundamentals. To be more specific – teaching proper tackling. According to College Football Film Room, the Irish missed a total of 106 tackles in 2016 and 112 tackles in 2015. These numbers equate to almost 9 missed tackles per game. Thinking back to last year, far too often the Irish defense was on the wrong end of a potential game changing defensive stop due to a missed tackle. The Brian VanGorder experiment was proof that a defense built on a foundation of scheme will always crumble. Furthermore, the idea of reverse engineering a defense by emphasizing scheme over fundamentals was a critical miscalculation. Fundamental tackling is at the bedrock of all great defenses. The kind folks at 247 Sports shared a video of a live tackling drill featuring the defensive backs and wide receivers. Jump ahead to minute mark 1:38 for some actual pad popping fun. Rep #1: Devin Studstill lays a solid initial hit on Miles Boykin without leaving his feet awarding a quick whistle from the coaches. Rep #2: Nicco Fertitta (personal disclosure: he is quickly becoming my favorite player) breaks down at the point of contact and delivers a textbook tackle with his head correctly on the outer shoulder of Keenan Centlivre. Fertitta is by far one of the best tacklers on the team, and also capable of bringing the boom. Sadly, I must remind you that he will miss the first half of the Temple game due to a bogus targeting call on one of the best CFB hits of the 2016 season (language on the video NSFW). Rep #3: Spencer Perry executes a fundamental tackle on Austin Webster. Again, important to note that Perry did not leave his feet and has his head correctly on the outside shoulder of the ballcarrier. Rep #4: Captain Drue Tranquil breaks down and utilizes his size to overpower the ever elusive walk-on Chris Finke. Rep #5: Spencer Perry breaks down nicely when approaching Kevin Stepherson, but pausing the video at 1:58 shows he commits the cardinal sin of lowering his head, thus rendering him unable to “see what you hit” as the saying goes. This enables the long and talented Stepherson to shrug off the feeble tackle attempt. Rep #6: Isaiah Robertson goes low on Mick Assaf and shows good drive with his legs while wrapping up the legs of the ballcarrier. Good work from the early enrollee. Rep #7: Donte Vaughn brings down Arion Shinaver in fundamental fashion. Additional promising results from neglecting to lunge and leave his feet. Rep #8: Equanimeous St. Brown brushes past a tentative Jimmy Thompson. Thompson engages St. Brown too high initially and is unable to recover against the more athletic wide receiver. Rep #9: DJ Morgan hesitates slightly against Miles Boykin, but is able to wrap up the bigger wide receiver. If you listen closely, you can hear a coach holler, “Don’t stop!”. Rep #10: I’m confident that the video captions are incorrect on this one. I highly doubt Brandon Wimbush is participating in live tackling drills. I believe the ball carrier is Chase Claypool, who puts a shake-and-bake on the would be tackler (I’m guessing it’s Devin Studstill). Studstill commits multiple fatal flaws in lowering his head and leaving his feet. This single rep alone accentuates the fact that live tackling drills need to be performed early and often throughout spring practice. Rep #11: Another caption blunder – I’m thinking this is #7 Nick Watkins on defense and Chris Finke carrying the ball. Watkins fails to get his head on the outside shoulder of Finke forcing him to lunge with an unsuccessful arm tackle. Rep #12: Julian Love makes the same mistake as Watkins, but is fortunate enough to wrap up his arm tackle on Keenan Centlivre. Rep #13: Troy Pride Jr. breaks down too early and gets caught flat footed against Chris Finke, and all it takes is one jab step by Finke to fly by Pride. Rep #14: A jersey number 38 showdown of Deon McIntosh and Chris Schilling provides some fireworks with McIntosh opting not to get fancy, but instead lay some lumber as the ballcarrier and smash through Schilling. It will be interesting to see where McIntosh ends up on the depth chart as a high ceiling, versatile, and apparently quite powerful athlete. Rep #15: Kevin Stepherson claims another victim in a flatfooted Jalen Elliot. Rep #16: In a rematch with Stepherson, Elliot redeems himself by successfully bringing down the ballcarrier in fundamental fashion. Rep #17: Equanimeous St. Brown continues his success in the drill – this time against a visibly frustrated Drue Tranquil. Rep #18: Nick Coleman, new to the safety position, brings down the much bigger Miles Boykin. Coleman aggressively attacks Boykin’s hips and eventually trips up Boykin proving that the low man usually wins. Rep #19: Ashton White’s hesitation allows Chase Claypool to beat him to the the center (red colored) line forcing White to grasp for jersey as Claypool cruises by. Rep #20: Nicco Fertitta against Arion Shinaver – “That was textbook” says Coach Lyght…enough said. Rep #21: Brian Ball is no match for the more athletic and incredibly intriguing Alize Jones. 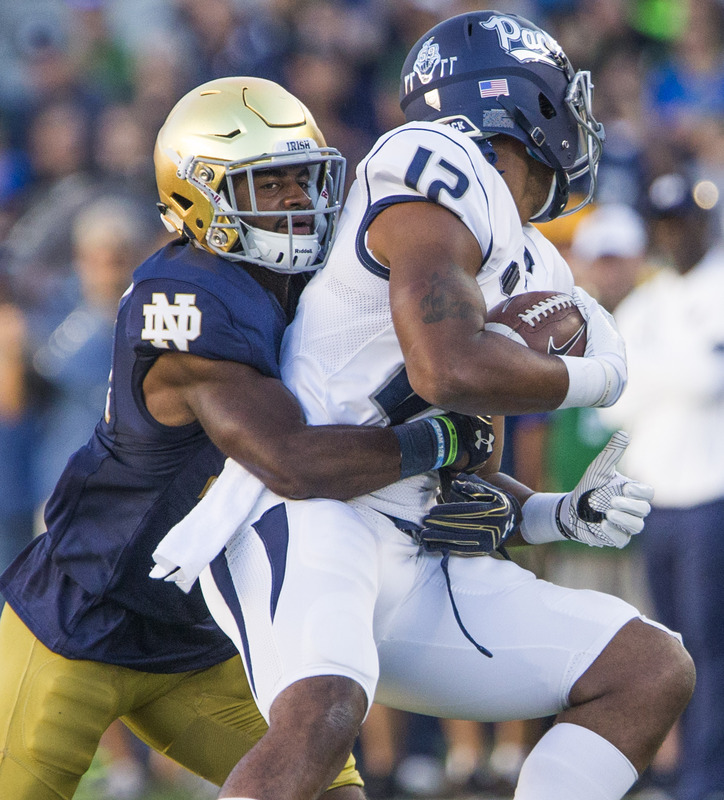 Brian Kelly commented that Jones is virtually uncover-able in certain areas of the field. Translation – return of the jump ball fade pass in the corner of the end zone. Rep #22: Mick Assaf tries to take advantage of the passive technique of Isaiah Robertson, but Robertson again opts to go very low and takes out the legs of Assaf. Robertson will likely need to be more aggressive in the future to take down more elusive and athletic ballcarriers. Rep #23: Spencer Perry lacks the proper leg drive to take down Keenan Centlivre. Rep #24: Chris Finke does “slippery fox” things and leaves DJ Morgan with his jock in his hand. Against Finke and other agile ballcarriers, Irish defenders need to be as aggressive as possible while not overcommitting and leaving themselves susceptible to a stutter step. Rep #25: Deon McIntosh makes an early cut and lowers his shoulder against Devin Studstill who makes great first contact, but McIntosh’s impressive leg drive is able to power through another quick whistle. Overall the tackling drills are obviously needed and welcomed. From the short, yet revealing, video it is apparent that the Irish defense needs to continue to hammer home fundamental tackling. This includes not leaving your feet, seeing what you hit, being aggressive yet under control, and wrapping up after the initial hit. Hopefully, we get to see another video of similar tackling drills displaying many improvements before spring ball is over. Thanks again to Tom Loy of 247 Sports for sharing the video.